The ProCPR course is a BLS course designed for healthcare professionals. This course includes CPR, AED, and healthcare provider specific skills like bag valve mask and 2-rescuer CPR. The curriculum for this course was based on the latest American Heart Association and ECC/ILCOR guidelines for CPR & BLS. The author of the course, Roy Shaw, is a licensed paramedic and professional CPR instructor. Roy will be your instructor if you choose to take the online course. The ProCPR curriculum has been submitted to and approved by hundreds of state and national boards and third party accrediting organizations since 2005. ProCPR is different from the typical CPR course you’re probably accustomed to taking. We believe that high quality CPR training is something everyone should be able to access, for free. 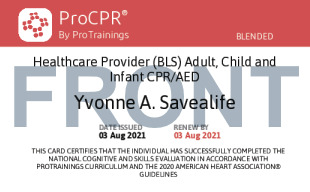 So, rather than paying simply to learn CPR, the payment is at the very end, only for those who need a certification card for work. We also believe that the problem with CPR isn’t that everyone is doing CPR incorrectly. The bigger problem is that people aren’t doing CPR at all. That’s why we start with the “why.” Why are people afraid to rescue? What happens when CPR doesn’t work? These are just a few of the parts of the training that will make even the most seasoned healthcare professional walk away from the course learning something new or thinking about CPR differently. Online - Online CPR training is the most convenient way to learn and is great for people without a requirement to have a hands-on evaluation. The online training begins with instructor-led videos where you’re in the front row of the class observing skills performed close-up with practice questions for comprehension and to get you ready for the final test. After the training, now it’s time to test your knowledge. You’ll be presented with a randomized, adaptive multiple-choice test to make sure you’re ready to act in an emergency. If you make a mistake, you’ll receive instant remediation by text and the opportunity at the end of the test to review videos that cover the areas where you struggled. Learning CPR isn’t about getting an 80% on a test. It’s about knowing what to do when it matters most! Blended - Blended CPR training takes advantage of the efficiency of online training, but adds a hands-on component to meet compliance requirements. The short hands-on evaluation can be done either in-person with an instructor or online over webcam. Classroom - Classroom CPR training, like blended training, is more likely to be accepted by state boards and employers who require a hands-on evaluation. 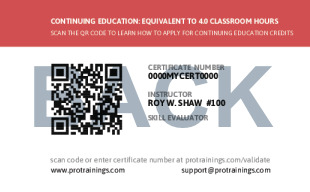 ProTrainings has a growing network of instructors around the country. Give us a call for help finding an open class or booking an instructor to teach at your company. Total course time includes 3 hours and 9 minutes of video training as well as knowledge reviews, final test, remedial help and reviewing downloaded material.